Transmission Services: How Does This Affect You? September 2016 Edition: Transmission is one of the many electric service components affecting energy prices for consumers, contributing to roughly 8% of your overall energy costs and in some regions of the United States it has reached as high as 30%. Most alarming, transmission costs throughout the country have been doubling and in some cases tripling in areas over the past decade. Transmission is one of the many electric service components affecting energy prices for consumers, contributing to roughly 8% of your overall energy costs and in some regions of the United States it has reached as high as 30%. Most alarming, transmission costs throughout the country have been doubling and in some cases tripling in areas over the past decade. Transmission developers and owners have demonstrated a need for investment in grid infrastructure and the Regional Transmission Organizations (RTOs) and regulators have approved a significant number of projects to upgrade the grid after years of little investment. In the midst of a natural gas revolution, there may be debate in coming years over the merits of this size investment in interstate electric infrastructure, especially, with meager electricity demand growth and significant technology gains in distributed generation. Regardless, transmission rates will continue to increase for customers for several more years as projects continue to be built so it is crucial that you consult with your AEP Energy trusted advisor to look at ways to actively reduce this line item. Most customers are billed for transmission charges by your competitive retail energy supplier. There are, however, some utilities, such as those in Ohio, who directly bill customers for transmission service and transmission related ancillary charges. To understand how transmission will affect your company’s energy budget, AEP Energy would like to outline some important aspects. Electricity, once generated, must be transmitted to your local utility before it is delivered to you. Transmission is the cost associated with the movement (or transfer) of electric energy over an interconnected group of electric wires, conductors, and other equipment (known as the transmission network). This network is used to move large quantities of power at high voltage, usually over long distances starting from a generating plant (receiving point) to major substations near your load (delivery points). 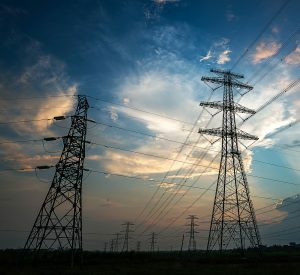 Transmission is under the jurisdiction of RTOs such as PJM and MISO, who coordinate the movement of wholesale electricity, but transmission is ultimately regulated at the FERC (Federal Energy Regulatory Commission) level. PJM controls a large portion of the northeastern region of the United States including Delaware, the upper Northeastern section of Illinois, the upper Northeastern section of Indiana, Kentucky, Maryland, the Southwestern tip of Michigan, New Jersey, North Carolina, Ohio, Pennsylvania, Tennessee, Virginia, West Virginia, and the District of Columbia. MISO controls the Midwest region of the United States in all or parts of Illinois, Indiana, Missouri, Iowa, Wisconsin, Michigan, Minnesota, Southwestern Kentucky, Arkansas, Louisiana, Alabama, Southeastern Texas, and portions of the Dakotas and Montana. Transmission is a cost derived from the delivery of energy from generators to consumers in a utility service area. Transmission owners are allowed a rate of return on their investment which is collected through a transmission rate that all retail and wholesale load pays. Transmission costs fluctuate by zone (utility) and are determined by your Network Service Peak Load (NSPL) and zonal transmission rate Network Integrated Transmission Service (Zonal NITS) for your utility service area. What is your Network Service Peak Load (NSPL), and how is this established? 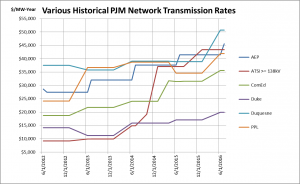 A customer’s Network Service Peak Load (NSPL) is determined in accordance with PJM and the local utility rules. Typically, at the end of a 12-month period, PJM and the local utility will identify the highest unrestricted load hour(s) that occurred on different days during the period. Your local utility will reconcile the different hours back when your energy demand was at its greatest to the highest unrestricted peak load hour that PJM has determined to be your local utility’s zonal peak load obligation. The customer’s transmission NSPL will be updated and billed for the next calendar year starting January 1, ending December 31. MISO, similarly, calculates the transmission charges each month based on load this is coincident with the zonal utility peak load that month. To obtain your organization’s NSPL and to look at ways to reduce it, contact your AEP Energy Sales Representative. What components impact your Transmission cost? Many utilities will apply a Daily Zonal Scaling Factor to ensure sum of NSPLs is equal to peak load on which rates are based. Zonal NITS Rate = Network Integrated Transmission Service rate by zone (utility). Number of days: The number of days in the calendar year when calculating your annual capacity cost. TCP = Transmission Coincident Peak (i.e. customer load at time of Ameren system peak load). AEP Energy makes every reasonable effort to present accurate and reliable information. Certain data, however, may be provided by a third party. As such, AEP Energy cannot guarantee the accuracy of the information provided herein. Understanding Electricity Supply Cost Components Energy Efficiency: What’s the Best Plan for your Organization?